MBS Day Ahead: With Rates on The Move, How Low Can We Go? There's no question that the Fed was surprisingly dovish yesterday--even among those who were expecting a dovish shift. But there is a question as to what moved markets in the wake of the Fed. Specifically, are we dealing with the Fed's surprisingly friendly interpretation of current conditions or are we trading the underlying reality of those conditions (with the Fed merely confirming that it wouldn't be too pessimistic to do so)? For its part, the stock market firmly declared it was trading the Fed's interpretation yesterday. In fact, the Fed announcement was widely viewed as an acknowledgement that a certain amount of stock market turmoil would result in a friendly policy shift at the Fed, as long as runaway inflation isn't standing in the way. In other words, the Fed has the market's back. This is actually a general truth of financial markets and monetary policy. The Fed is always going to try to engineer less reckless boom cycles and gentler economic downturns. Only time will tell if it's a good idea to interfere with natural momentum so predictably. Either way, stocks were puzzled in December as to why the Fed didn't say predictable stuff relative to its past precedent. It turns out the Fed was just one meeting late, and now we're back to the predictable baseline. But that was yesterday! Today is a different story. Stocks are sideways to slightly weaker yet bonds continue to rally. As seen in the chart above, bonds also found reason to rally yesterday, and it's a safe bet most of that reason was shared with stocks (i.e. surprisingly friendly Fed interpretation). But stocks will be the first to tell you that the Fed's INTERPRETATION of underlying conditions isn't being traded today. Rather it's the underlying conditions. Trade wars, deficits, political gridlock, temporary shutdown bills, a housing downturn, relatively higher rates for the past 2 years, global economic uncertainty, Brexit fallout, corporate debt levels, earnings headwinds, you name it! Without compelling data or developments to sooth fears about those underlying conditions, bonds can continue to explore lower yields. Granted, such data or developments could arrive at any moment, but they aren't here today, so down we go! But how low can we go? We'll talk more about these charts in the coming days, but here are a few ways to look at it. The first involves conjecture about what the current consolidation might look like. After all, we're not convinced that recession is imminent just yet, but we also have no reason to fear a big, immediate bounce back toward higher rates. All we have for sure is a big pile of uncertainty following a big move over the past 2 months. Such piles tend to take the shape of consolidation patterns. My guess is that we're still in one and that yesterday just made it bigger by adding room to the lower margin. For context, such consolidations are almost a rule after big moves higher or lower, but there can be head fakes (i.e. 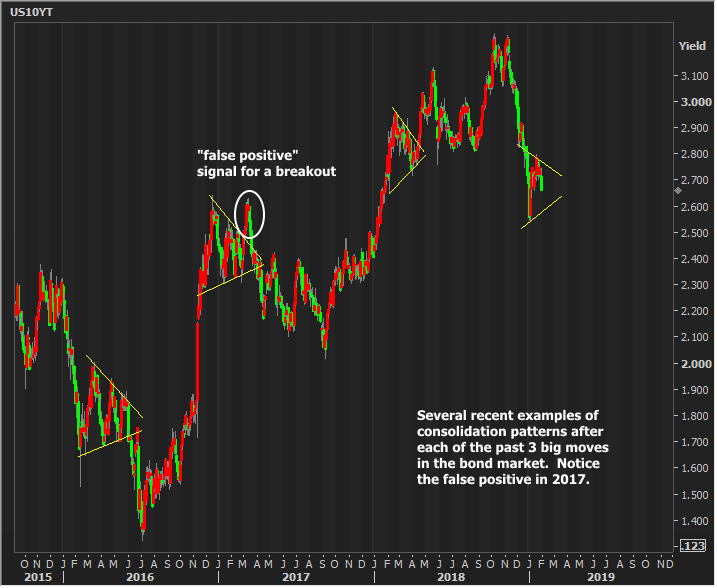 "false positives") as seen in the following chart. One additional way to look for key levels is via moving averages. 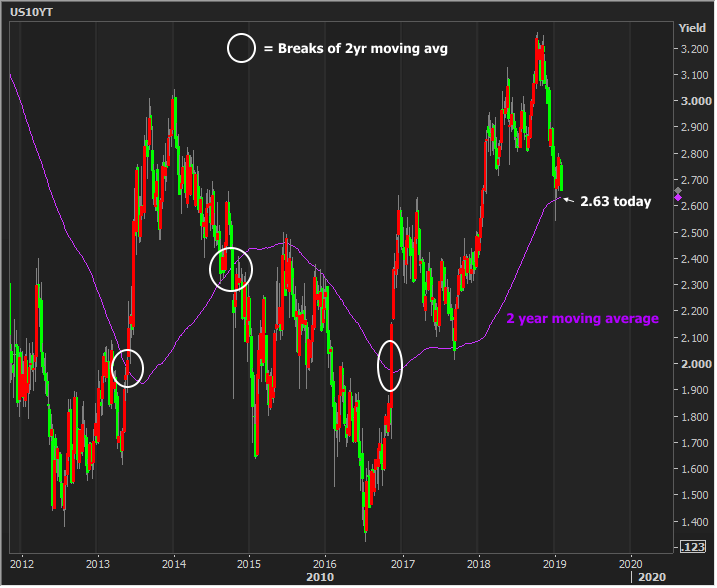 These aren't my favorite technical tools, but I do like pondering the super-long term averages as long as we're not expecting a day or two of breakout movement to be considered a confirmed breakout. That said, this 2 year moving average has been pretty dang close to perfect in recent years. We haven't broken it yet, but if we can manage to move through it convincingly, the implications speak for themselves.